Binchotan charcoal is full of surprises. It has a metallic sheen that belies its wood origins, and yields powerful heat despite burning cleanly and silently, without smoke. Though it doesn't start easily, once ignited it burns steadily with a beautiful flame, giving those who master its use new control over the flavor of grilled foods. So-called “black charcoal” is made by firing wood in a kiln until it is carbonized, then closing all the flues and sealing the kiln to shut out air intake and extinguish the fire. The charcoal is left to rest until it has cooled. 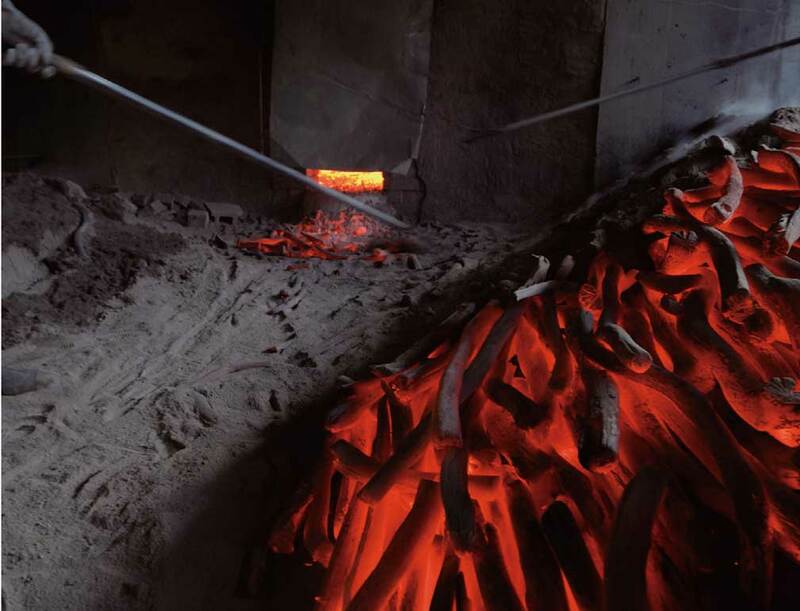 In contrast, to make the premium Binchotan, also known as “white charcoal,” the kiln door is opened at the final stage of burning so that the nearly carbonized logs and other flammable substances inside blaze at a higher temperature of 1,000°C or more, burning off all impurities and leaving nothing but pure carbon. When the carbonization is complete, a blend of ash and sand is thrown over the charcoal to extinguish the flames. This sprinkling of ash is why Binchotan charcoal looks grayish white. Rock-hard, it gives off a shiny metallic luster and even makes a sharp metallic sound when one piece is struck against another. If you didn’t know this material had once been wood, you’d never guess. Binchotan charcoal has become so popular lately that it is fast becoming a precious commodity. Its veteran makers are aging, and as supplies of ubame oak, the traditional raw material for it, dwindle, evergreen oak is now increasingly used instead. Prices are rising, and charcoal dealers in Japan predict that Binchotan will disappear in as little as 10 years. Almost synonymous with the Binchotan name is the Kishu brand made in Wakayama prefecture. Yet Kamitosa Binchotan, which hails from Kochi prefecture on the island of Shikoku, ranks equally among the highest- quality Binchotan charcoal available in the world today. As it is produced by the oldest living master in the region, it almost seems a pity to burn such an artisanal material. This is a product that should be used and enjoyed only by those who truly appreciate its worth. Interested in viewing our binchotan collection? Click here.